Nothing beats a refreshing glass of fresh grinded fruit juice on a hot summer evening. 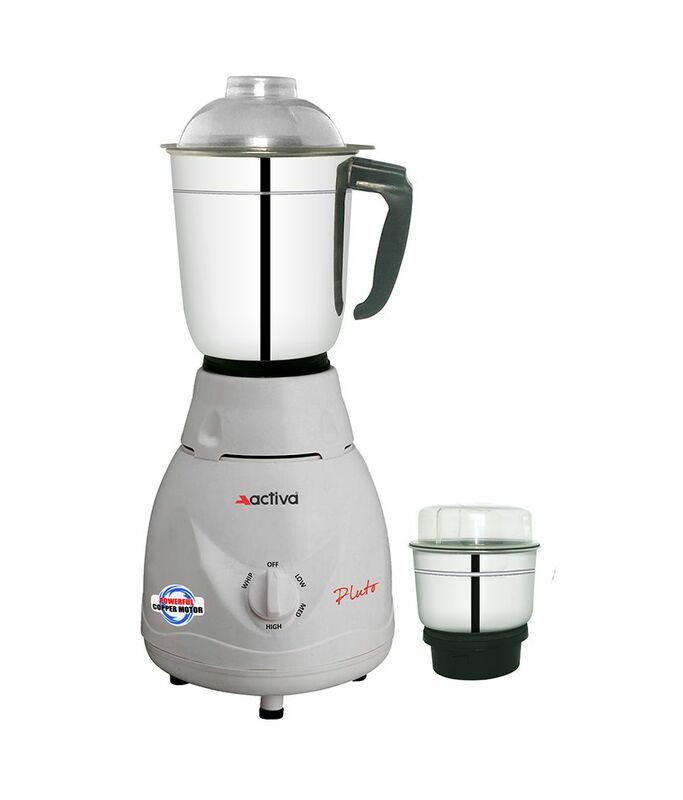 Bring home the Activa Mixer Grinder and live in style. Prepared with 3 speed settings, the distinctively crafted blades add the perfect touch of grinding. The mixer grinder is capable of mincing and grinding meats as well as makes juice out of vegetables and fruits effortlessly. Be it dry or wet grinding of spices for a traditional Indian meal or chopping and dicing leafy vegetables the mixer grinder always come in handy. Whatever the type just pop them in and the unique speed setting will dice and chop them the way you like. This product comes with 12 month manufacturer warranty. This utilitarian Activa Mixer Grinder has a contemporary and smart design with an artistic sense of color and is sure to glam up the décor of the kitchen. The speed of the blades can be controlled with the knob on the main unit and the entire set sits perfectly on the kitchen counter. The outer material of the jars is made from fine quality ABS plastic and the inner lining is made from rust free stainless steel which ensures durability. It is white in color and is a perfect addition to every kitchen. 1. EXTRA POWERFUL 500 WATTS COPPER MOTOR. 3. ENGINEERED ABS (PLASTIC) BODY. 4. THREE SPEED CONTROL WITH INCHER THAT FACILITATES YOU WITH 3 SPEED CONTROL MECHANISMS THAT ENABLES YOU TO GET THE PERFECT INGREDIENTS AS PER YOUR REQUIREMENTS. .
6. WITH AN OVERLOAD PROTECTION FEATURE, THE HIGHLY EFFICIENT VOLTGUARD SUPERB MIXER GRINDER PREVENTS ANY THERMAL OVERLOAD. IT AUTOMATICALLY GETS SWITCHED OFF TO PREVENT OVERHEATING OF THE APPLIANCE. 7.THE 2 HIGHLY EFFICIENT STAINLESS STEEL JARS THAT CAN EASILY SORT OUT VARIOUS PRE-COOKING TASKS SUCH AS GRINDING DRY SPICES, MAKING PUREE ETC. THE SHOCK-PROOF BODY MAKES IT SAFE FOR DOMESTIC USAGE.